Holiday greetings to all of my music video kindred spirits, it’s Andy Gesner and the staff from HIP Video Promo, hoping you’re having a festive and fruitful conclusion to 2007. We’re not sure there are any small cities in the United States with a more storied musical heritage – or a more active underground scene – than Athens, Georgia. If an Athens group can distinguish itself from its peers, it’s safe to say that it’s only a matter of time before the rest of the nation takes notice. Modern Skirts are no strangers to the 40 Watt Club’s legendary stage, and won Flagpole Magazine’s Athens Music Award for the year’s best album in 2006. They’re local heroes in the Southeast – and as usually happens to guitar-rock quartets who win the allegiance of the collegiate town (and some of its most famous rock and roll citizens), mainstream has come calling for them. National Public Radio recently profiled the Skirts, calling Catalogue Of Generous Men, their thoughtful debut, “diverse and immediately accessible.” Paste Magazine has featured the band twice, dubbed them an act to watch for 2006 and praised their songwriting talent calling their “jubilant, exuberantly catchy piano-and-guitar rock a formula for bliss.” Paste music editor Jason Killingsworth pickedCatalogue as his number one album in his year-end top ten list. The quartet has toured the region, sold out numerous North Georgia stages, shared bills with the likes of the Drive-By Truckers, the Lemonheads, the Whigs, and performed at an unannounced REM performance in Athens. 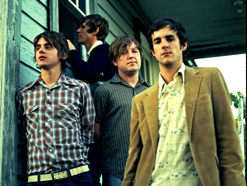 The band has also made wildly-received appearances at Pianos and the Mercury Lounge in New York. The Skirts just finished their first tour of the United Kingdom in October, and the band was the only American band to be asked to showcase at this year’s In The City music conference in Manchester. A DVD release featuring Jack Wallis’s moody, elegant clip for “Pasadena” is in the works for the near future. The song is quintessential Modern Skirts: harmonies, subtle but insistent drums, meditative lyrics, acoustic instruments, and a soaring, irresistible melody. Fans of The Shins, Elliott Smith, Graham Coxon’s solo work, and the poppier side of Wilco will feel instantly at home; others will surely be won over by Jay Gulley’s winsome voice. Elsewhere on Catalogue Of Generous Men, the band rocks energetically – with “Pasadena”, Modern Skirts pull back to produce something altogether majestic and lasting. It’s become a concert and fan favorite, and the band’s calling-card. Director Jack Wallis is another Northern Georgia upstart: he’s made DVDs for notable local and national bands and followed others on tour to capture them in action. His live footage of Morningwood, available for download on the New Slang Films website, in concert is remarkable, but there’s nothing raw about his reel – his finished work is polished, provocative, and artfully-composed. Most of the “Pasadena” video is filmed in black and white at a desolate motel, with each member of Modern Skirts isolated in a separate room. Guitarist Phillip Brantley, nearly swallowed by the shadows, leans back on a made bed, strumming his guitar and singing softly to himself. He’s contemplating running away – ditching it all and not telling anybody where he’s going – and Wallis’s monochromatic palette perfectly matches the somber mind-state of the lyrics. But there’s a twist: the image of a burning spinet, shot in full-color, is frequently superimposed over the frames. The director flashes it on windows, rear-view mirrors, screens tossed in junkyards. It roars away behind the band – a symbol of wild escape; an irruption from a world aflame. It’s our greatest pleasure to be working directly with band manager Troy Aubrey and the cool cats in Modern Skirts to deliver this winning video to you and your viewers. We are confident that you will embrace this video just as much as we have here at HIP HQ. We’ve been supplied with copies of their widely desired album, Catalogue of Generous Men, so please notify us if we can set you up with copies for giveaway or contests with your outlet. If you need more info, call Andy Gesner at 732-613-1779 or e-mail us at HIPVideo@aol.com. You can also visit www.ModernSkirts.com to find out more about Modern Skirts.